Citation Information: J Clin Invest. 2017;127(4):1126-1135. https://doi.org/10.1172/JCI88885. Steroid hormones mediate critical lineage-specific developmental and physiologic responses. They function by binding their cognate receptors, which are transcription factors that drive specific gene expression programs. The requirement of most prostate cancers for androgen and most breast cancers for estrogen has led to the development of endocrine therapies that block the action of these hormones in these tumors. While initial endocrine interventions are successful, resistance to therapy often arises. We will review how steroid receptor–dependent genomic signaling is affected by genetic alterations in endocrine therapy resistance. The detailed understanding of these interactions will not only provide improved treatment options to overcome resistance, but, in the future, will also be the basis for implementing precision cancer medicine approaches. Steroid receptor (SR) structure and function in endocrine therapy–sensitive and –resistant cancer. (A) Schematic structure of the SR proteins AR and ER, which belong to the nuclear receptor TF superfamily and harbor two transcriptional activation domains, the N-terminal ligand–independent activation function domain (AF-1) and the C-terminal ligand-dependent AF-2 domain. The LBD also resides in the C terminus, while the DNA-binding domains (DBDs) and hinge domains are in the central core of the proteins. (B) SRs are the main targets of endocrine therapy, which induces tumor regression in sensitive PCa and BCa. In general, AR and ER function as ligand-dependent TFs that act as homodimers when activated in response to hormone binding. 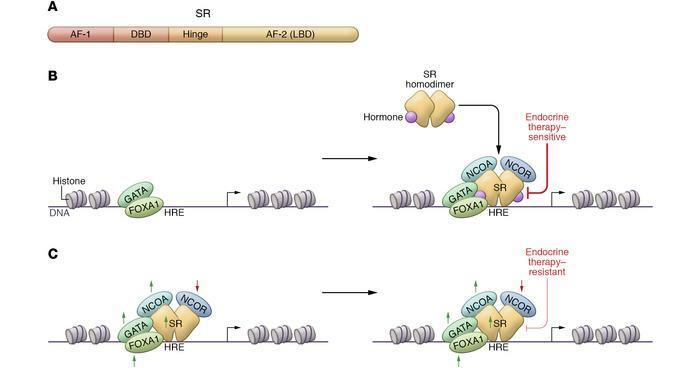 Androgens bind to AR, while estrogens bind to ER, and the respective receptor-ligand hormone complexes directly recognize specific DNA sequences harboring hormone response elements (HREs). Upon their DNA binding, transcriptional coregulators, including NCOAs and NCORs that mediate the regulation of hormone-responsive genes, are recruited. In addition, collaborating pioneer TFs of the FOXA1 and GATA families ensure the establishment of oncogenic gene expression programs that drive prostate and breast tumors. (C) Reactivation of SR in endocrine therapy–resistant PCa and BCa can be due to genetic alterations in the SR, in their transcriptional coregulators and in their pioneer factors, resulting in altered transcriptional activity. Enhanced activity in therapy-resistant disease is shown with green arrows pointing upward, whereas reduced activity is shown with red arrows pointing downward.